Typing to the Sound of Bagpipes | KMA and Co. Early in my career, I worked for a man who played bagpipe music on a boom box when he was writing. He also would post a sign with a skull and crossbones on his door. I took the sign as a warning not to complain about the bagpipe music. Gary was actually a very amenable guy, particularly when compared to his business partner – but that’s a story for another post. So one day when he was not in writing mode, I asked why the bagpipe music. A bit of context may be appropriate here. The company was a campaign consulting firm. Most of our writing was published in the form of the campaign mailers that litter your snail-mail mailboxes before an election. To break through the clutter, our writing had to be particularly concise and compelling. Gary explained that good writing was like music, that it crescendos and decrescendos, repeats variations on a theme, has a rhythm that moves the listener (or reader) along. So playing music when he writes helps him keep that in mind. 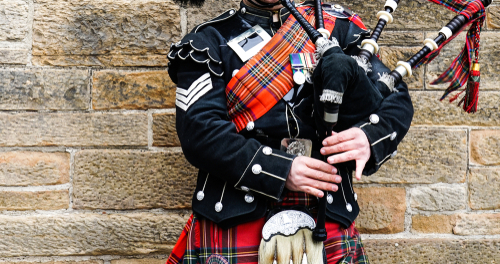 The bagpipe part was due to his Scottish heritage. Despite Gary’s example, I do not listen to music when I’m writing. I prefer absolute silence, so I’m not distracted from the rhythm as it comes to life on the page. But to each his own. I never begrudged Gary the bagpipe serenade, despite the fact it was quite annoying at times. So next time you take on a writing task, you might want to crank up Bach, the Rolling Stones or a bagpipe dirge for inspiration. But in consideration of your co-workers, I would suggest using your earbuds.